Neeta Tours and Travels Phone Number, Customer Care Number, Enquiry Number, Contact Number, Mobile Number, and more information given here. Buying bus tickets online is one of the best ways to save your time and money. You should buy bus tickets online by visiting popular bus booking websites, such as PayTM, Redbus, Abhibus, Yatra, MakeMyTrip, ibibo, and other portals. To get good deals on bus tickets online, you must visit these websites. Alternatively, you can book your bus tickets on GSRTC website. In this article, we have provided contact information of Neeta Tours and Travels for various locations. So, let’s see! Andheri Office Address: Western Tower, B-1, New Prabhat Co-Operative Housing Soiety Ltd, Western Express Highway, Andheri-[E], Mumbai-69. Goregaon Office Address: 19, Sarvodaya Nagar, Near Aarey Check Naka, W.E.Highway, Goregaon-[E], Mumbai. Kandivali Office Address: Shop No.3, Mehrun Chawl, Mahavir Nagar, W.E.Highway, Opp. Samtanagaar Police Chowki, Kandivali-[E], Mumbai-101. Neeta A-1 Pune Station Office Address: Pune Station sasoon road opp-S.T. stand, Pune. Malad Office Address: 37/38, Malad Shopping Centre, S.V.Road, Malad-[W], Mumbai-64. Vile Parle Office Address: Shop No.180, Bhajiwadi, Shastri Nagar, Western Express Highway, Near Petrol Pump, Vileparle-[E] Mumbai-99. 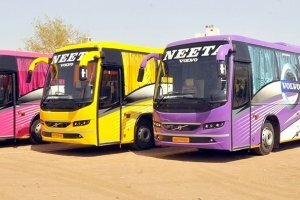 Neeta Bus Baroda Address: Neeta Travels (H.O) Nr. Pandya Hotel Shop – 8,B/S Gurukrupa Hotel, Nr.Pandya Bridge,Chani Road,Baroda. SG Highway Ahmedabad Address: Opp-infinium toyota show room Near Divya Bhaskar Press, S.G. Highway. Neeta Bus Satellite Ahmedabad Address: Manas Complex satelite Jodhpur Cross Road,Opp-Star Bazar.